Baby crocodile was modeled to give an idea about crocodile to young kids. We all know that this animal is dangerous and looks ugly for some. But not for the baby though. 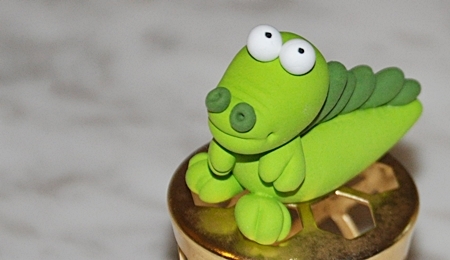 Let's the young kids recognize the shape of the animal by creating crocodile clay figurine. The basic shapes used for the crocodile are only two, ball and teardrop shape. Clay tools (detailing stick with rounded end, one small and one big and clay knife). Anyway, if you don't have the tools you can use toothpick, chopstick, and cardboard as clay knife. Choose the clay color you like. Make them in two shade, light and dark. I chose green color for my crocodile. And, small white clay for the eyes. 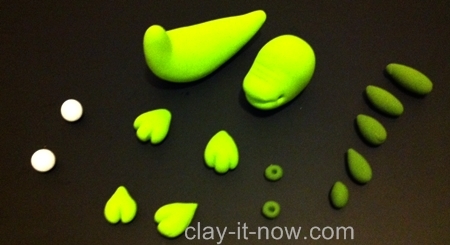 Body: Start rolling the clay to ball shape and then teardrop shape. You'll have the sharp end and the rounded base. Keep rolling the tip of the rounded base to about 1 centimeter and bend it up for the neck. Head: Also started with the ball shape, oval and then press left and right side of the oval clay to the table to create tapered shape and flatten it a little bit. Legs: Roll small teardrop shape, flatten it and use your knife or cardboard to create the 3 fingers - lightly press on the wider side. Arms: Same step with the legs. Nostril:: roll darker clay color to two small ball shapes, flatten it and use the tooth pick or clay tool to make a hole in the middle of it. Back: Roll 5 teardrop shapes in different sizes (big to small), same color as the nostril. Eyes: make two ball shapes of white clay color. Make a hole at the base of the head so that the head will sit nicely on the crocodile's neck. Make a slit in front to make a smile line/ mouth and three lines on the head. Glue the head to the neck. For bigger size figurine you may need to insert the toothpick on the neck to make it stronger. Glue the legs and arms. Arrange the position as you like to add a character to the figurine. And glue the rest of the items.